DePauw alums and administration pulled out of the annual banquet and roast after last year’s event. Then the Indianapolis men swung into action and created the Thursday night event. nearly 130 Wabash men, significant others, and friends gathered at the historic City Market to celebrate the Monon Bell series. See photos from Thursday’s gathering here. The IAWM welcomed President Gregory Hess, Coach Erik Raeburn and numerous college leaders joining area alums. President Hess lauded the support and enthusiasm of Wabash alumni and introduced the head coach. 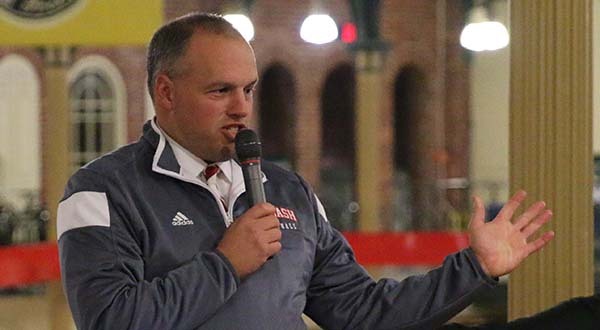 Raeburn took his time to entertain with self-deprecating remarks and a few jabs at NCAC officials. He noted that “Wabash Always Fights” isn’t limited to the football team but every student who attends Wabash. The group enjoyed small plates, Sun King brews, and the camaraderie of Wabash grads of all generations. 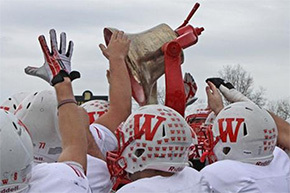 That’s not tinnitus sweeping across campus, it’s only the sound of the Monon Bell tolling from the Chapel steps ringing in your ears. Below are the responses of Wabash men — both current students and alumni — when asked what was their favorite Wabash tradition. I sat in on Scott Himsel’s Founding Brothers and Revolutionary Characters freshman tutorial recently, and plopped down in the middle of a lively debate. To observe was almost enjoyable as taking part. 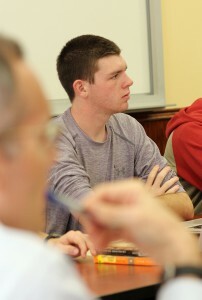 I’m a sucker for the Founding Fathers and became intrigued with this class over the summer when Cameron McDougal ’12 said it was the most influential class he took at Wabash. After a few run-ins with Himsel and discussions about the class, he invited me to attend. Himsel often asks students to argue in favor of perspectives they disagree with. It teaches them, Himsel says, “to walk around the entirety of the problem” McDougal took the class thinking he could rely on the words of Thomas Jefferson. More often than not, Himsel had him arguing from the position of Alexander Hamilton. You could tell these guys were enjoying the process, at least as much as the thumb-worn, dog-eared, underlined and highlighted copies of “Something That Will Surprise the World” could attest. Himsel poked and prodded his students through the discussion with his own questions: “Are you sure?” “Could you take that a step further?” He went so far as to pull out a dollar bill to make a point. He wasn’t stifling or correcting, but giving these gentlemen the freedom to walk around this problem. Watching people think; to see the wheels turning – to see them reach for a book, thumb through a section, and look for just the right passage in response – is fun. Himsel brings the class to conclusion by relating the day’s questions to current court cases. Words from another century easily can be lost in translation, but these words still carry weight, even when borrowed by sitting Supreme Court justices. After class, several students came forward and asked nuanced questions—they were not only engaged, but were developing a critical eye. As this mid-term election season comes to a conclusion tomorrow, we’ve seen plenty of politicians cloak themselves in the language of the Founding Fathers. It’s reassuring to see this group of students grasping the importance of perspective in the ability to discern persuasion from political speak.